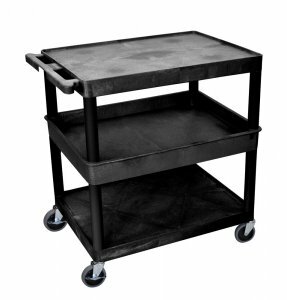 3 Shelf Multi-Purpose Heavy Duty Utility Cart: Flat Top and Bottom Shelf with a Tub Middle Shelf. 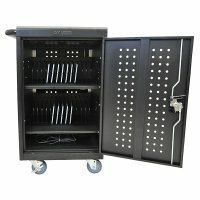 A great multi-purpose mobile cart for storage or transporting items. 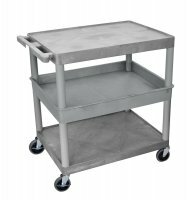 A push-handle is molded into the top shelf to ensure easy turns. Shelves are reinforced with aluminum bars for added strength. Luxor lifetime warranty.